The injection of water on very high performance engines used in competition has been a common custom in 70 years 80. - increase the admission rate, Ie the mixing mass, cooling the mixture or intake air by evaporation of the water. So this was increasing the specific power of the engine. - increase resistance to detonation of the mixture (Ie increase the octane number of the mixture). In this sense, it joined the MW50 injection - Methanol Water - on the 2ieme World War fighter aircraft. - cool internal components (Including: folder, valve seat, piston ...) engine during heavy duty. Let us now see some concrete examples of water injection in competition: Renault Sport Formula 1, Ferrari, and SAAB. In 1982 the Renault Turbo V6 developed 585 horses, it was the first engine used in F1. In 1977, 525 it was horses, gain power between these versions 2 was minimal. But during the years we focused on other field: reliability, smoothing of the power curve and decrease response time (power to command). Once these atteinds goals, we sought to increase power and, in 1986, 6 was Turbo V870 the horses in race conditions. So if between 1977 and 1982, 60 we won hp (11,5%), we had gained almost 300 (51,3%) between 1982 and 1986. To reduce capacity in the detonation of an engine, we first had thought to find a way to cool the air mixture, which had been compressed and therefore heated by the Turbo. This was therefore the function of heat exchangers (intercooler). However, their effectiveness was limited when the ambient outside temperature was very high (of Brazil GP) or during large price carried out at high altitude (South Africa, Mexico ...). Under these conditions, or oxygen was rarefied by the altitude is the mass of air passing through the intercooler was decreased by the ambient temperature and therefore the expected cooling effect was less. In 1982, Jean Pierre Boudy who had the idea of ​​lowering the temperature of the air leaving the Turbo by injecting water into the intake. Once the water was in contact with hot air, it is thus sprayed and pumped heat to this air. The temperature of the intake mixture (gas and air) then decreased during its passage through the intake manifold. So we managed to decrease to 10 12 ° C the temperature of the compressed air inlet that was before around 60 ° C. It was enough to prevent the detonation! During the ordeal opening 1983 season, the Brazilian Grand Prix, Renault became the first manufacturer to use an injection to Formula 1 to decrease the temperature of the intake mixture. The system included a tank 12 liters of water, set on one of the side of the car and a control unit installed behind the pilot's head. This control unit included an electric pump, a pressure regulator and a pressure sensor. This sensor triggered the system once the intake boost pressure exceeded 2,5 bars. Below this pressure, there was no risk of detonation so the water injection was not helpful. The water was drawn in by the pump and passed through the regulator which maintained a constant flow before being injected into the collector. This system required starting each race with an overweight of 12 L. This weight handicap made us lose 3 tenths per lap in the practice sessions. But it was less of a disadvantage than the "classic" method of road vehicles which was to delay the advance ignition. Renault was therefore the first manufacturer to adopt the water injection to preserve turbo-compressed engines of the detonation (which was destructive for the engines). 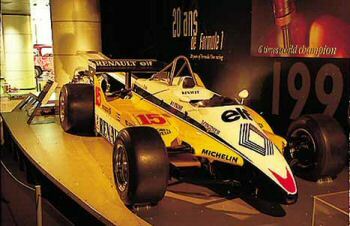 It is 1977 the 'Régie' launches in F1. the time of the settlement offers two possibilities to motorists: a liter atmo 3 or 1,5 liter turbo. While all the teams are opting for large three-liter turbo Renault made the bet with a small V6. At Silverstone, the 17 July RS01 Renault made its first laps. Weakness of the turbo engine, reliability is sorely lacking during the first races to the point that the RS01 is nicknamed the yellow teapot because of its engines breaks into a cloud of smoke. But gradually, the Renault technology becomes more successful. In 1978 Renault turbo imposes the 24 Hours of Le Mans and in 1979, this is the first victory in the Diamond F1 at the Grand Prix of France. 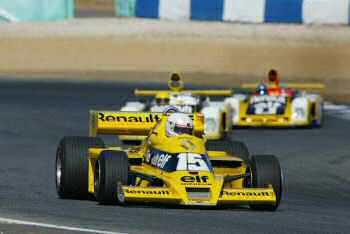 From these early successes, all the teams will follow in the Renault turbo technology to become indispensable from 1983. In the early 90 years, Renault has won for six years the world title as engine manufacturer.